The last week leading up to the wedding was very hectic, but thanks to family and friends we were able to complete everything. We were so rushed to get stuff out of my old apartment into the new one that there really was no time to organize and get everything straightened out. All of my belongings got thrown into our new apartment...there was barely an inch to walk on, boxes everywhere. 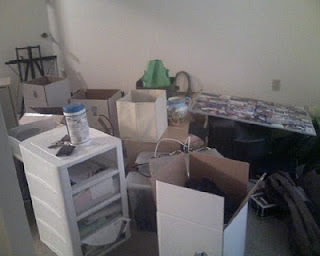 Here's a small pic from my camera phone of the mess. Our big project before the wedding was getting the ceremony programs put together. My computer (of course) got a nasty virus and wouldn't even open Windows. Then the printer wasn't working on Eric's computer, but after a couple hours of work he figured it out and we got printing! I spent a whole night punching out the programs, but had barely put a dent in them. Thankfully, the next day Chad and Amy came over and saved us from the agony of doing it all ourselves. With our team work the project got finished much faster than expected. Then there were other little projects like putting the candy for the nests in baggies and finalizing the ceremony/reception outlines. Thanks to Jenna (who took over the project) I didn't have to worry about table numbers or the sparkler bucket (for the exit). Friday flew by so fast. Heather, Jenna, and I got our nails done at the mall. We also stopped by MAC and got them some fake eyelashes. Though I didn't write about it on here I had previously gotten the semi-permanent (2 week) eyelashes and they were horrible! Please do yourself a favor and NEVER get them. I couldn't get them off after two weeks no matter the amount of baby oil applied and my mom ended up tearing them out (hours of pain = not fun). Anyways, my mom took me to MAC to have them show me how to do my make-up for the wedding day and I decided to try their fake eyelashes (since mine haven't looked as full since the incident). I have to say, I really like the MAC lashes! The glue doesn't hurt your eyes (no fumes) and they come off so easily! They stayed in place the whole day and then I just tugged at the end to peel them off. I don't remember exactly which kind I got, but here is a link to the eyelashes on there website - MAC eyelashes. I think they are worth it to give your eyes an extra pop for a special occasion. 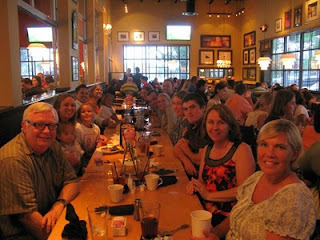 After leaving the mall I went back to get ready for the rehearsal and rehearsal dinner. The rehearsal for me was a bit hectic, but I tried not to worry about it. We started late and the Baughman Center people were very prompt in kicking us out once our hour was up. The rehearsal dinner was a really nice change. We got to celebrate and relax with our closest friends and family. The buffet worked out really well and the food was awesome. After the rehearsal dinner I got to go with my family and Heather to visit my grandparents who were able to make it. :) Then we headed back to the Hampton Inn and Suites in Downtown Gainesville to sleep before the big day. I would suggest this hotel to anyone that is staying in the area. It especially worked out well for us because our reception (at Steve's Courtyard) was a couple of blocks away (walking distance). The hotel is new, clean, well decorated, has spacious suites, and the staff was very helpful and accommodating (unlike some other hotels...ahem...the Hilton). Needless to say, I didn't get much sleep that night. How can you sleep when you are getting married in the morning?! So many emotions are tugging at your heart strings. You are happy that the day is almost here, excited to make such a huge committment, scared something might go wrong, ect. (you get the point). Then I got up and it was the day of the wedding (my wedding)!